Upfront confession: I cribbed the title from a recent blog by Paul Krugman. Upfront warning: this is a wonky post about China’s third quarter balance of payments data. The recent run of data out of China has been awful. Auto sales. Apple sales. Imports. Exports. The financial press, though, isn’t as calm as the foreign exchange market. The turn of the year brought a host of stories about China’s deteriorating balance of payments. The current account is about to swing into a deficit. Reserves are falling (a bit). Rather than buying U.S. treasuries, China is now competing with the U.S. Treasury as it seeks to raise funds globally. In this case, I think the market is right not to worry—or at least not to worry that the balance of payments will force a depreciation if China itself doesn’t first signal that it wants a weaker currency to offset the current bout of economic weakness. If China runs a current account deficit this year, I suspect it will be small, and nothing that a country that has run roughly thirty years of surpluses cannot finance out of its accumulated assets. 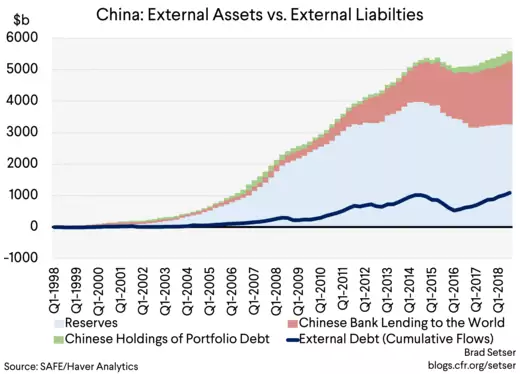 External debt is up, but the overall level of debt is still modest relative to the size of China’s economy—and the rise in debt in recent years has largely been matched by a rise in China’s assets abroad. The rise in bond inflows into China is an important story, but China isn’t (yet) all that dependent on these inflows. Domestic savings is still around 45 percent of GDP—that can finance an awful lot of investment and a quite large (hidden) fiscal deficit without any external borrowing. And there is actually a bit of good news in China’s balance of payments data. With all the trade tension, and with reasonably sized currency moves over the summer, China will almost certainly still have added to its reserves in 2018. In the balance of payments data that is—the different measures here don’t fully align, but the balance of payments should be the best metric. That’s a big change from 2015, or 2016. Even with the depreciation over the summer, there wasn’t a big draw on reserves. At least not a visible one. 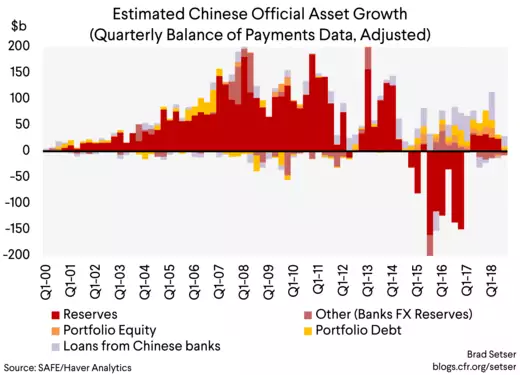 In q3, the balance of payments only shows a $3 billion fall in China’s reserves. That’s nothing. Don’t get me wrong. The yuan is managed. 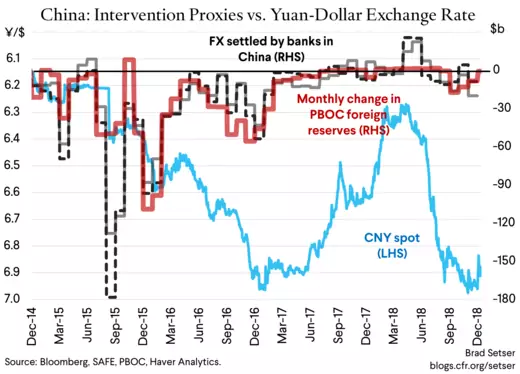 The state banks sometimes help the PBOC out, and likely both bought and sold foreign exchange over the course of the year (capping yuan appreciation in the spring and capping yuan depreciation in the fall). Capital flows into—and especially of—China are controlled. Without those controls China would be intervening a lot more (the PBOC 's foreign balance sheet didn't change in December). The current equilibrium is not the result of unfettered markets. It just may be a fairly robust equilibrium in the absence of a shift in policy. I suspect the financial account will stay fairly balanced so long as China doesn’t signal that it wants a weaker currency in response to a slowing economy. And, well, if China signals that it wants a weaker currency to offset a weakening economy, the balance of payments won’t stay in equilibria for a long. Will China Run a Large Current Account Deficit in 2019? China’s export growth is certain to slow in 2019. Exports might even fall year over year in dollar terms. UBS is forecasting a 3-4 percent rise for the year, but there are obvious downside risks (for comparison, exports were up 10 percent in dollar terms in 2018; the q4/q4 rise was 4 percent even with a weak December). But imports are also poised to slow, and might slow more than exports. That’s what happened in December, the (goods) surplus rose even as trade slowed (the trailing 12m sum of China's monthly trade surpluses is also now heading slightly up, though this could change rapidly if the trade truce doesn't hold). Falling prices for oil and semiconductors will really help China—these two products alone account for something like a quarter of total Chinese imports. And it wouldn’t surprise me if import volume growth slowed a bit more than reported GDP growth, in part because China’s 2018 import growth was a bit stronger than can be easily explained. That’s particularly the case for China. China’s move toward a current account deficit is in part a function of what the British used to call “invisibles”—flows that are estimated in the balance of payments rather than actually counted at the border like goods. The tourism deficit is real, but its size hinges on how China chooses to measure it—the new methodology introduced in 2014* (in 2015 in practice, but it got backdated) accounts for the bulk of China’s tourism growth over the last five years. Then there is the complicated matter for accounting for the earnings of foreign investors in China. Profits earned in China enter into the current account as a debit (on the income line) even if the funds never leave China. Reinvested earnings are a debit on the current account and credit in the financial account. What about the financial account? Doesn’t it balance simply because of an unsustainable (Russian!) increase in foreign demand for Chinese bonds? There is no question that China’s external debt has been rising. I like to leave out the inter-company debt counted in the FDI data, and—using the net international investment position data for bank claims and portfolio flows—I come up with a rise of around $400 billion since the end of 2016. But China’s offshore assets have been rising nearly as fast as China’s external debt. 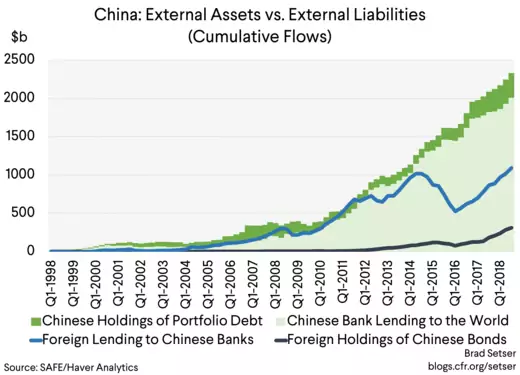 This rise thought is less visible than it used to be as the bulk of the rise in China's foreign assets these days is coming through the banking system, not through an increase in the PBOC's reserves. Even so, going by the balance of payments, reserves have increased by $100 billion since the end of 2016. ** The pace of accumulation slowed in q3, as private inflows fell off. But it didn’t stop completely. What has Changed in the Last Few Years? And What Hasn’t? 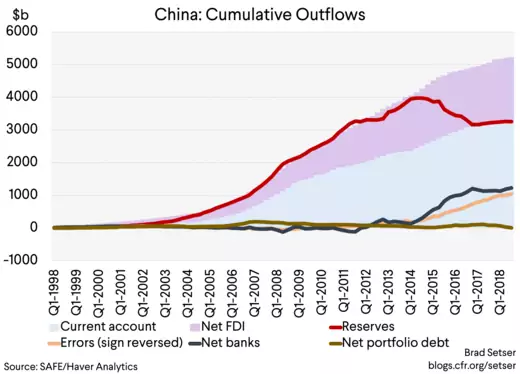 To get a picture of what has happened over time in China’s balance of payments, I used an old data trick: I summed up nearly all the flows in the balance of payments over the last twenty years. 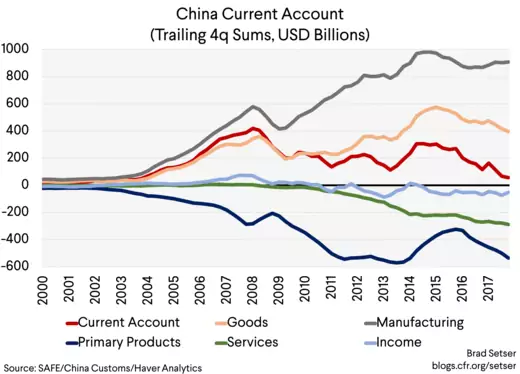 And then I compared the implied build up of assets abroad to China’s cumulative current account surplus, and to the sum of China’s current account and net FDI inflows over this period. There was a shift in 2014—when the pace of “hot” outflows (the errors line on the chart) rose. As I have noted previously, this rise has structurally slowed China’s underlying need to intervene. There was another shift that has been less noticed. The net foreign assets of the banking system rose substantially after 2014. Much of the fall in reserves since 2015, mechanically, stems from a shift in the state’s asset away from the PBOC and SAFE (China's reserve manager) and toward institutions like the China Development Bank and China Exim. So what might disrupt the current equilibrium, one where flows—strangely—basically balance? The collapse of trade negotiations. China might well want a weaker yuan to offset the imposition of 25 percent tariffs on the bulk of U.S. trade with China (see the move this summer). And the market would certainly think China would want a weaker yuan, and force China to show that it was willing to resist downward pressure. Or a protracted domestic downturn in China. 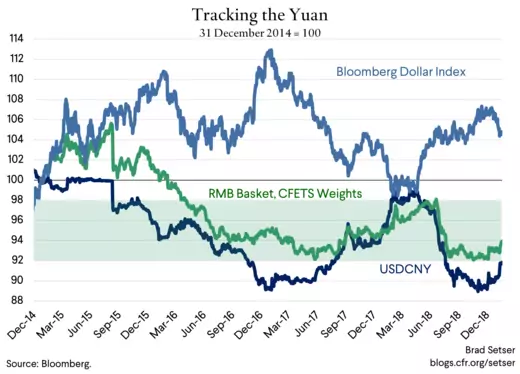 China might then conclude that letting the yuan depreciate (against the dollar and the basket) is in its own interest even if the trade talks are going relatively well. When you think about it this way, the Trump administration now faces a risk if it walks away from the trade talks. The talks have provided China an incentive to keep their currency relatively stable even as their economy weakened. What won’t disrupt the current equilibrium? The end of foreign demand for China’s bonds. A $150 billion inflow can be both big relative to flows to other emerging economies and still relatively small for China. China can make up for the loss of an inflow of just over 1 percent of its GDP in a lot of ways—slower accumulation of external assets for example. *China’s treatment of reinvested earnings as a debit on the current account and a credit in the financial account is technically correct—it is how the United States does it as well. But it isn’t the norm for most emerging economies. And, well, I have some doubts that China’s new methodology for measuring tourism outflows is actually an improvement on the old methodology. It does though serve the purpose of limiting the size of the “errors” term in the balance of payments. **My adjustments assume all long-term loans come from state institutions (which is almost by definition true) and that the state banks and the CIC account for the bulk of portfolio outflows (which is consistent with the state banking data and the timing of the increase in China’s offshore equity holdings). ***The IMF’s reserve metric got China wrong, as the IMF China’s team now recognizes. Alas, some in the market and the financial press still use the IMF’s flawed basic metric uncritically, without even making the obvious adjustment for a closed financial account.